Corporate Income Tax (CIT) is a direct tax levied on a juristic company or partnership carrying on business in Thailand or not carrying on business in Thailand but deriving certain types of income from Thailand. 1.1 A company or a juristic partnership incorporated under Thai law. 1.2.1 A company or juristic partnership incorporated under foreign laws and carrying on business in Thailand. 1.2.2 A company or juristic partnership incorporated under foreign laws and carrying on business in other places including Thailand. 1.2.4 A company or juristic partnership incorporated under foreign laws which has an employee, an agent or a go-between for carrying on business in Thailand and as a result receives income or profits in Thailand. 1.2.5 A company or juristic partnership incorporated under foreign laws and not carrying on business in Thailand but receiving assessable income under Section 40 (2)(3)(4)(5) or (6) which is paid from or in Thailand. 1.3 A business operating in a commercial or profitable manner by a foreign government, organization of a foreign government or any other juristic person established under a foreign law. Thai and foreign companies carrying on business in Thailand are required to file their tax returns (Form CIT 50) within one hundred and fifty (150) days from the closing date of their accounting periods. Tax payment must be submitted together with the tax returns. Any company disposing funds representing profits out of Thailand is also required to pay tax on the sum so disposed within seven days from the disposal date (Form CIT 54). In addition to the annual tax payment, any company subject to CIT on net profits is also required to make tax prepayment (Form CIT 51). A company is obliged to estimate its annual net profit as well as its tax liability and pay half of the estimated tax amount within two months after the end of the first six months of its accounting period. The prepaid tax is creditable against its annual tax liability. As regards to income paid to foreign company not carrying on business in Thailand, the foreign company is subject to tax at a flat rate in which the payer shall withhold tax at source at the time of payment. The payer must file the return (Form CIT 54) and make the payment to the Revenue Department within seven days of the following month in which the payment is made. 1. a newly incorporated company or juristic partnership may elect to use the period from its incorporation date to any one date as the first accounting period. 2. a company or juristic partnership may file a request to the Director-General to change the last day of an accounting period. In such a case, the Director-General shall have the power to grant approval as he deems appropriate. Such an order shall be notified to the company or juristic partnership who files the request within a reasonable period of time and in the case where the Director-General grants the permission, the company or juristic partnership shall comply to the accounting period as prescribed by the Director-General. In the calculation of CIT of a company carrying on business in Thailand, it is calculated from the company's net profit on the accrual basis. A company shall take into account all revenue arising from or in consequence of the business carried on in an accounting period and deducting therefrom all expenses in accordance with the condition prescribed by the Revenue Code. As for dividend income, one-half of the dividends received by Thai companies from any other Thai companies may be excluded from the taxable income. However, the full amount may be excluded from taxable income if the recipient is a company listed in the Stock Exchange of Thailand or the recipient owns at least 25% of the distributing company's capital interest, provided that the distributing company does not own a direct or indirect capital interest in the recipient company. The exclusion of dividends is applied only if the shares are acquired not less than 3 months before receiving the dividends and are not disposed of within 3 months after receiving the dividends. 11. Depreciation: Provided that in no case shall the deduction exceed the following percentage of cost as shown below. However, if a company adopts an accounting method, which the depreciation rates vary from year to year, the company is allowed to do so provided that the number of years over which an asset depreciated shall not be less than 100 divided by the percentage prescribed below. 2) Fund except provident fund under the rules, procedures and conditions prescribed by a Ministerial regulations. 5) Capital expense or expense for the addition, change, expansion or improvement of an asset but not for repair in order to maintain its present condition. 6) Fine and/or surcharge, criminal fine, income tax of a company or juristic partnership. 8) The part of salary of a shareholder or partner which is paid in excess of appropriate amount. 9) Expense which is not actually incurred or expense which should have been paid in another accounting period except in the case where it cannot be entered in any accounting period, then it may be entered in the following accounting period. 10) Remuneration for assets which a company or juristic partnership owns and uses. 11) Interest paid to equity, reserves or funds of the company or juristic partnership itself. 12) Damages claimable from an insurance or other protection contracts or loss from previous accounting periods except net loss carried forward for five years up to the present accounting period. 13) Expense which is not for the purpose of making profits or for the business. 14) Expense which is not for the purpose of business in Thailand. 15) Cost of purchase of asset and expense related to the purchase or sale of asset, but only the amount in excess of normal cost and expense without reasonable cause. 16) Value of lost or depleted natural resources due to the carrying on of business. 17) Value of assets apart from devalued assets subject to Section 65 Bis. 18) Expense which a payer cannot identify the recipient. 19) Any expense payable from profits received after the end of an accounting period. 20) Expense similar to those specified in (1) to (19) as will be prescribed by a Royal Decree. 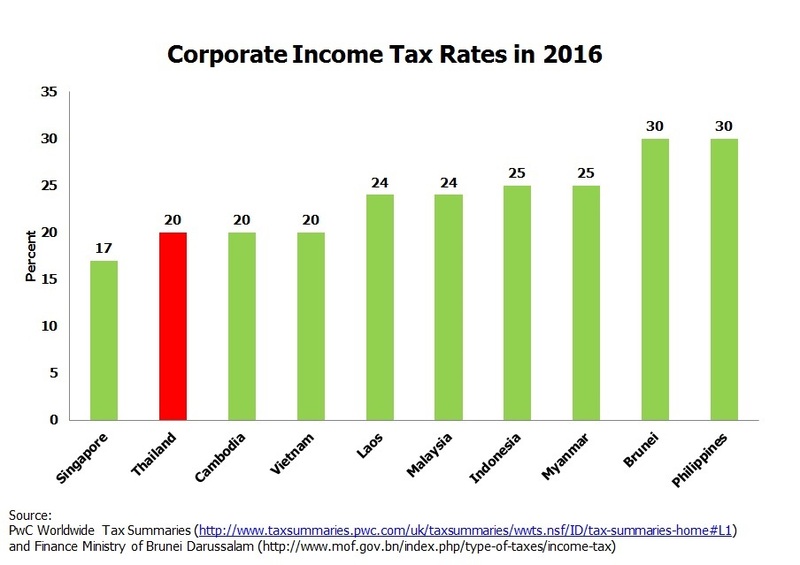 The corporate income tax rate in Thailand is 20% on net profit for the accounting periods 2015. However, the rates vary depending on types of taxpayers. 9. Foreign company disposing profit out of Thailand. 10. Profitable association and foundation. Notes: 1 A small company refers to any company with paid-up capital less than 5 million baht at the end of each accounting period. Certain types of income paid to companies are subject to withholding tax at source. The withholding tax rates depend on the types of income and the tax status of the recipient. The payer of income is required to file the return (Form CIT 53) and submit the amount of tax withheld to the District Revenue Offices within seven days of the following month in which the payment is made. The tax withheld will be credited against final tax liability of the taxpayer. The following are the withholding tax rates on some important types of income. 1. Tax will be withheld on interest paid to associations or foundations at the rate of 10%. 2. Royalties paid to associations or foundations are subject to 10% withholding tax rate. 3. Government agencies are required to withhold tax at the rate of 1% on all types of income paid to companies. Each company is taxed as a separate legal entity. Losses incurred by one affiliate may not be offset against profits made by another affiliate. Losses can only be carried forward for a maximum of five years. For income derived from countries that do not have a Double Taxation Agreement (DTA) with Thailand, foreign tax credits are allowed. These foreign tax credits are subject to certain criteria and conditions, up to the amount of Thailand tax that would have been payable had the income been derived in Thailand. The same rules apply with regard to foreign tax relief for DTA countries. In addition to paying dividends, profits may be repatriated through other various means, including payment of royalties and/or service fees. Although there is no separate transfer pricing legislation in Thailand, guidelines have been issued to counteract aggressive inter-company pricing practices and to ensure such payments reflect the true market value. These guidelines are intended to prevent the manipulation of profits and losses within a group of related companies and ensure that goods and services traded between the related companies are priced at an arm’s length value. The Revenue Department also has the power to assess income resulting from transfers which it deems below market value.